TobyMac's latest tour is utilizing a pair of DiGiCo SD10 consoles. 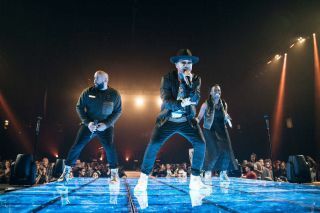 The tour, which features a cavalcade of leading Christian music stars, includes two separate stages set up in each venue, enabling near-continuous music performances and culminating in TobyMac’s own show. What makes this complex proposition work is the flexibility of the two DiGiCo SD10 live sound consoles provided by Blackhawk Audio, the SR provider for the tour. “The SD system gives us a very cool way of handling a situation with multiple stages,” said Ryan Lewis, the monitor system tech, who is working along with FOH Engineer Ryan Lampa, Monitor Engineer Heath Mahon, Systems Tech Scott Beale and main System Tech Pat Haapanen from Blackhawk Audio. Each stage has a dedicated SD-Rack. The SD-Rack and the SD10 consoles are connected via fiber over an Optocore network. The DiGiCo SD10 consoles are used for both stages, and their snapshot recall is used to instantly access the setups, using the console’s master screen or hard-wired switches for each artist that was programmed in prior to the tour. “It took about two weeks of programming to get all of them together, but once we had them, it made managing the show so much easier,” said Lewis. In addition, special functions can be assigned and accessed instantly via the console's 40 Smart Key Macros (accessible via four layers of 10 RGB backlit keys) at the push of a button. The mixers are using the SD10’s Set Spill feature in conjunction with the macros. They are also using macros to manage their squawk-box communications between FOH, monitors, and two stage tech positions through the consoles’ matrices and talkback busses. “The two console positions are 115 feet apart and the two stages are 72 feet, so the ability for CON send and receive through the desks lets us maintain communications easily and reliably,” said Lewis. Lewis notes that they are also doing something new with the DiGiGrid MGB coaxial MADI interfaces on this tour.